Question 1: Is your topic notable? Question 2: Has your topic received significant coverage by neutral, reputable third-party sources? Last week, we took an in-depth look at notability. This week, we’re going to discuss sources. What is a “Third-Party” Source? A third-party source is a source that is not directly related to you, your company, or your product. Although there’s no hard-and-fast rule about how many sources are required for a Wikipedia article, it’s a good idea to find as many as possible to create your article. If you can’t find any third-party sources to use, your topic is not appropriate for Wikipedia. In other words: no sources = no article. What is “Citing a Source”? Citing a source is basically just a way of saying, “Hey, I didn’t make this stuff up. I can prove it. If you want to verify it for yourself, you can check out this article/magazine/book.” Sources and citations help keep the Wiki community honest. 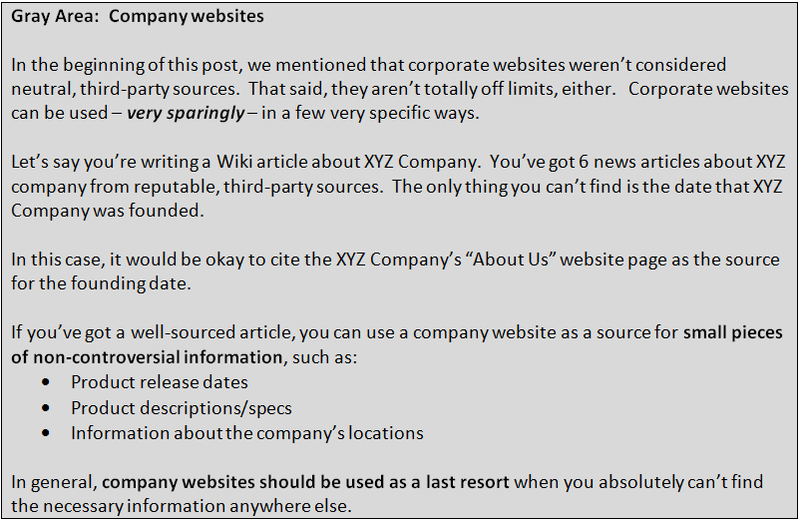 What should you cite when writing a Wikipedia article? Pretty much everything that’s not common/general knowledge: facts, figures, dates, quotes – you name it. The Wikipedia community is very strict about the use of reliable third-party sources. Wikipedia is also very strict about its role as a repository of existing information – meaning, information, statistics, and facts that have been documented and written by third-party sources. What does this mean for you? Well, if you use a fact and you can’t cite it, Wikipedia will flag that fact as “original research.” If you want your fact to “stick,” you’ll need to attribute that fact to a third-party source. And if you can’t attribute a fact to a third-party source, you shouldn’t put it on Wikipedia – even if you know it’s true. Wiki articles that don’t have sources end up “flagged” by Wikipedia editors. None of the information in blue is particularly controversial or contentious – which is probably why this section isn’t flagged for “original research.” All this needs is a couple of good sources that tell us when the different home video versions of the movie were released. Below is a section from the Wikipedia page about ham. In this case, the section has been flagged for containing original research. This section makes all kinds of claims about food safety and processes – and almost none of the “facts” presented here are cited. Even if the statements in the orange boxes are true, they still need to be cited – otherwise the entire section may be deleted from the article. 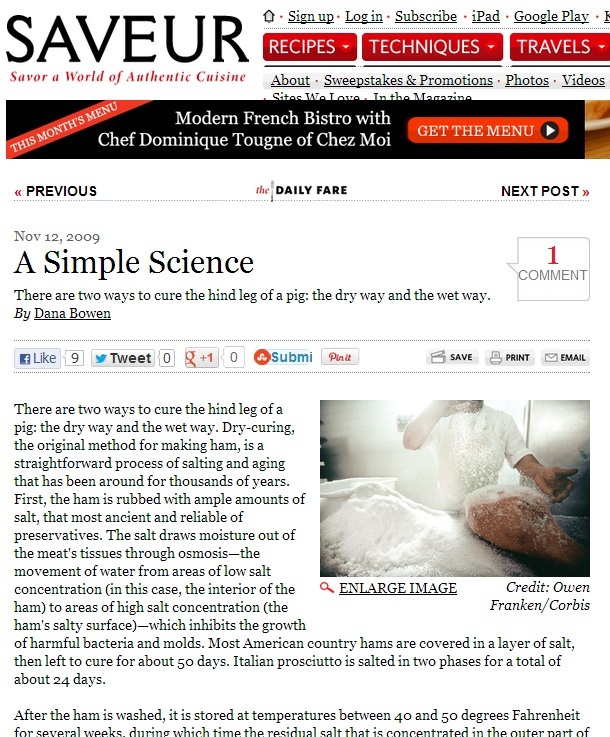 Both the USDA website and the Saveur magazine article are appropriate sources for a Wikipedia article. 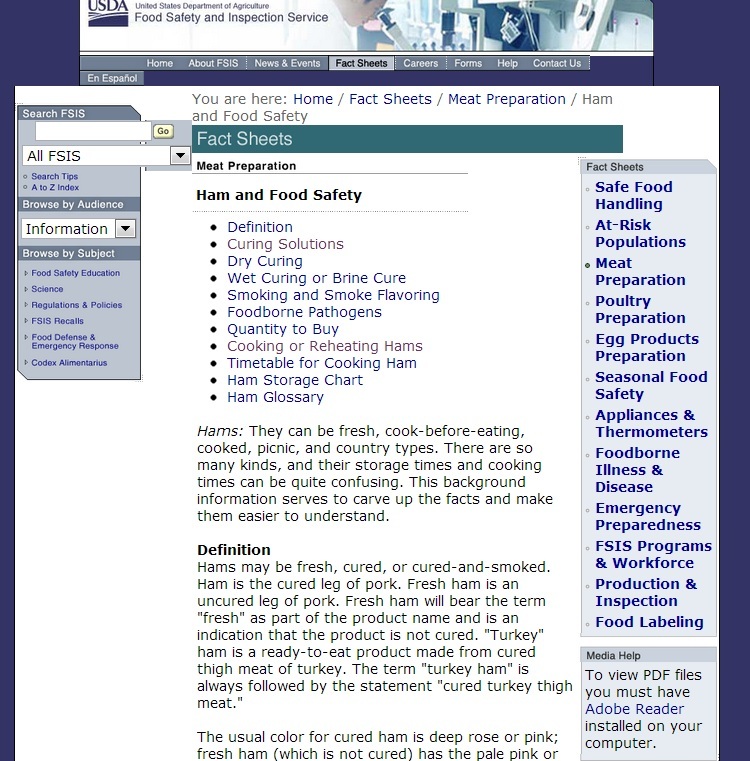 And those are just two examples – there are tons of places to look for information about a topic like food safety. The sources are out there. All Wikipedia articles must be based on existing information from neutral, third-party sources such as magazines, newspapers, or government websites. Every fact, date, conclusion, and quote in a Wiki article must be cited. A Google search is a good way to find sources. Company websites can be used – sparingly – as long as you rely primarily on good, neutral third-party sources.